The Templars were accused of heresy for various spurious reasons, including the supposed worship of the being, Baphomet. This baseless accusation is still being against Freemasons to this very day. Derived from the Greek words for baptism and wisdom, Baphomet is a symbol that can only really be understood by delving deeply into the Mystery traditions and Gnosticism. The fact that Satanism adopted the Baphomet image has caused further confusion and damage to the Brotherhood. This short, but sweet video helps provide some clarification on the issue. Freemasonry is a misunderstood tradition. People have all sorts of wild ideas about what Masonry really is and what it’s symbolism could possibly mean. The truth is, even many Masons out there are not aware that Masonic symbolism goes very deep and has an esoteric, as well as exoteric meaning. This symbolism is the heart and soul of Masonry and teaches truths that defy words. Before written languages, ancient civilizations used symbols to communicate ideas and to teach truths. Many of these symbols are so similar across the globe, that it leads one to believe that they might be inherent to the human mind. Even if these symbols are not understood at first glance, they still have an effect on us. Freemasonry uses symbols in addition to ritual to communicate great moral truths. As the candidate advances through the initiations, they are given explanations of the exoteric meanings of these symbols. It is up to the candidate to dig deeper and find the esoteric meanings within these symbols that will open the doors of the mind. Like the layers of an onion, these symbols can be peeled away layer by layer revealing new truths each time. Going into the entire gamut of Masonic symbolism would take more time than I have, so I will go into just a few of the most iconographic symbols of the Craft. The Square and Compasses and the letter G and the point within a circle. First off, we have the most recognizable of all Masonic symbols. The symbol by which the Craft is known. The Square and Compasses with the letter G in the center. The square and compasses are actual masonry tools of the operative stone masons. They are used by the craftsmen to design and perfect stones for building. Why then were these tools used to represent speculative, or philosophic Masonry, in which no actual operative masonry is conducted? The Regius Poem, or Manuscript circa 1390, that operative stonemasons were taught to live by a moral code and that this was inherent to the early craft guilds. These tools were used to perfect stones for building and are used in Speculative Masonry to represent the perfection of the self through moral teachings. The letter G in the center is an open-ended symbol and can stand for God, Geometry, Genesis, or even the Generative principle. It is to show that these concepts are at the center of Masonry and are the backbone of the teachings. This exoteric explanation is only part of the story of the Square and Compasses. These symbols hold a much deeper and profound teaching. We learn through the Mystery traditions that the square is likened to the earthly realm, while the circle is likened to the heavenly realm. This is encapsulated in the alchemical concept of “squaring the circle”. Both of these elements are tied together by the very symbols used to denote the Craft. These elements can be looked at metaphorically as well. The earthly realm is that of animal instincts and is ruled by creature comforts, whereas the heavenly is ruled by the virtuousness and morality. 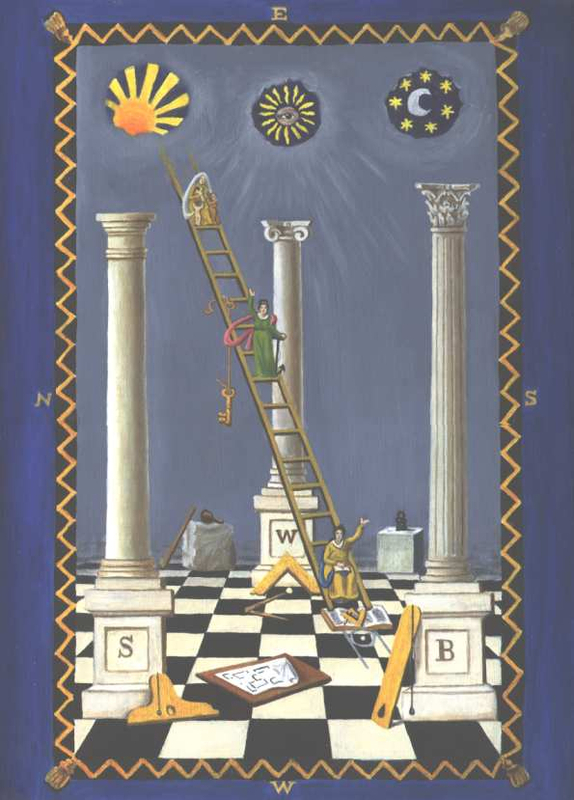 As the candidate advances through the degrees of Masonry, the Compasses are said to be elevated above the Square, symbolizing that the individual’s soul is on the path to perfection and that they should be driven by divine pursuits rather than the vices of earthly pleasures. This is, in essence the goal of the Masonic teachings. Secondly, is the point within a circle. This symbol is one of the oldest symbols known to man and has carried over into all parts of the world. It is the symbol for the sun in ancient cultures such as Egypt. It also resembles an eye, which is often a symbol for God. In Masonry, the point is representative of the individual and the circle represents the moral boundaries of society. This is to show that we belong within these boundaries and should never stray. Yet again, this is only the exoteric meaning of “the point within a circle” symbol. Alchemy is one of the great mystery traditions of antiquity and uses a process to achieve and end result. Like Freemasonry, Alchemy also employs an operative process to teach an internal, moral perfection. Alchemy is most commonly known as a process of changing base-metals into gold, and although this may have been one of it’s goals, it was not the primary goal. Alchemical Gold is a metaphor for perfection. Perfection of the human soul. The alchemical symbol for gold (or perfection) is a point within a circle. This perfection of the self, or soul, is the same goal of Freemasonry. In the quest for enlightenment, we must look to all of the ancient mystery teachings for guidance. Each system has it’s own powerful system of symbols. These symbols may seem mysterious at first, but if studied can unlock great truths. They should be understood, rather than feared. Hopefully, through this latest series of blogs, I have shone some light on the misunderstood elements of Freemasonry. It is up to you to explore them further and to find your own truths within.